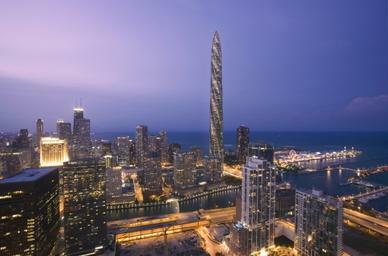 The Spire may yet rise up from what is currently a large hole in Chicago. Garrett Kelleher's grand vision, a structure that would be his mark on the world, was felled by bad timing and the collapse of the real estate market. Like your average stubborn Irishman, however, he did not let the dream die. Since the financing first fell through all those years ago, he kept at it, seeking new financing and another partner willing to take a great risk. Alas, the property market that collapsed and took The Spire with it has not quite recovered. The resurrection has not yet been scheduled, apparently, because Mr. Kelleher is finding it difficult to get the money to pay off his old debts and get out of bankruptcy and then find more money to build the iconic building. His current partner does not have what is needed to fund the massive effort. Or is unwilling to gamble that much on a project that requires a more robust real estate market to sell luxury condominiums at high prices. Sure the view is grand, but who has that many millions to invest in a place to live? There's more than enough choice available in Chicago, even though none of it was designed (down to the door knobs) by a famed starchitect. So the case drags on. Mr. Kelleher must get permission from the judge in bankruptcy court to go find others willing to invest, to cover what Atlas Holdings is not funding. As for the firm that currently holds the debt, it is willing to give Mr. Kelleher the time he requests to find other sources. If he manages to line up the investors, Related Midwest (which bought up the debt) gets paid in cash. If he does not, Related Midwest gets paid in land, which is at the moment an abandoned building site with a big hole in it. Who wouldn't prefer to take the money? The deals and counter-deals would boggle the mind with the tangle of clauses and terms and who gets what if things go one way but then there's this if things go another. The Spire is not yet dead. To follow along with the court case is to witness a resurrection, or at least a whole-hearted attempt to breathe new life into an idea that was declared as dead as the Celtic Tiger a few years ago. What is helping the resurrection along is faith, a belief that the building would ultimately be of benefit to the city of Chicago which is known for its architecture, and a belief that if you build it people will buy because there is a unique cachet not to be found in the ordinary highrise. What is needed for the building to rise again is a belief by those who hold the money. A belief that the property market is going to be reborn as well. And evidence of that event has yet to be spotted.